With tool holders, locking drawers, and locking casters. 20"W x 16"D x 32"
Enova CE Portable Station w/ industrial casters. Features pull-out bread-board, two drawers, and tilt-out tool panel w/ six-outlet power strip and holders for blow dryers, clippers, and three curling irons. 15 1/2"W x 15"D x 35"H x 38"H.
Beauty Salon Trolley with 6 drawers is perfect for your salon, barbershop, spa, etc. beauty needs. The top features a space to sit the drawer in use. 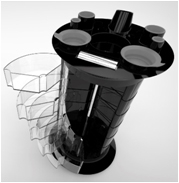 The sides have 4 accessory trays with built in appliance and brush holders with removable cups. This cart has easy open drawers providing easy access to all your styling needs from both sides. Zeta Color Cart has 6 drawers and is perfect for your salon, barbershop, spa, etc. beauty needs. The top features a color bowls, built in timer and brush holders with removable cups, and a space for brushes. This Zeta Color Cart has a Z like frame with open drawers providing easy access to all your Coloring needs. There is no other like this on the market. Zeta Hair has 6 drawers and is perfect for your salon, barbershop, spa, etc. beauty needs. The top features a blow dryer holder, built in appliance and brush holders with removable cups, and a space for scissors and brushes. This cart has a Z like frame with open drawers providing easy access to all your styling needs. There is no other like this on the market. • Appliance Holders (1- Blow Dryer, 2- with removable trays), 3-for brushes, 4-scissors or combs, a towel holder, 3 small open plates and 1 large open plate. 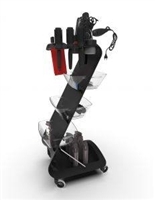 Trolley Lite is perfect for your salon, barbershop, spa, etc. beauty needs. The top features a blow dryer holder, built in appliance and brush holders with removable cups, removable tint bowls, and a space for your foil sheets. This cart has a 360-degree rotation providing easy access to all your styling needs. The 360 Trolley Lite is made with ABS plastic which has a strong resistance to corrosive chemicals. It has all your cut, color, and style accessories in one convenient space.